Newcastle's frontline, without striker Craig Bellamy, helped their team to an easy FA Cup victory over Coventry. Captain Alan Shearer opened the scoring with a low shot after fine work from Jermaine Jenas down the left wing. Striker Shola Ameobi doubled the lead with a superb run and shot that beat keeper Luke Steele at his near post. A Dele Adebola header made it 2-1 on the stroke of half-time but Celestine Babayaro made sure of the win with a fierce strike straight after the break. Despite the absence of Bellamy from the St James' Park ranks following his outspoken remarks, the Newcastle teamsheet, with the addition of new signing Amdy Faye, still looked a formidable one for the visitors to tackle. But despite their superiority, the Magpies only tested keeper Steele a couple of times, prior to Shearer's opener, in the first half. Left-back Babayaro, returning from injury, created the first chance of the match when he forced Steele to palm away low down to his left before Jenas' point-blank header produced another superb reflex save from the shot-stopper. But a Coventry clean sheet was always in doubt with Shearer about. Seven minutes before the break, the Magpies captain latched on to a square ball from Jenas, to plant his shot low into Steele's right-hand corner. And moments later, Ameobi's jinking run ended with another low shot that beat Steele inside his near upright. But with almost the last touch of the half, Coventry hitman Adebola, who had come on to replace the injured Andy Morrell, reduced the deficit to give Souness' men something to think about in the dressing room. However, it did not take the Magpies long to restore their two-goal advantage when Babayaro eluded his marker down the left and fired a fierce shot past Steele, aided by a deflection from Adie Williams. "We won the game comfortably. The way they set out to play with the one up front meant we were going to have a lot of the ball. "We controlled it from start to finish. We had a sloppy five minutes before half-time, but we looked tight, compact and we knew what we were doing. "The one disappointment apart from that five minutes would be that we didn't score enough goals." "It was a fair result. To be fair, we're still learning lessons. "I saw an improvement in the way we went about our business from last week, particularly the way that we defended. "Generally, I'm pleased with the effort, but class tells in the end." Newcastle: Harper, Carr, Bramble, Andrew O'Brien, Babayaro, Dyer, Faye (Hughes 81), Jenas, Kluivert, Shearer, Ameobi. Subs Not Used: Given, Milner, Taylor, Robert. 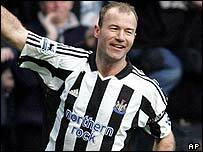 Goals: Shearer 37, Ameobi 42, Babayaro 52. Coventry: Steele, Duffy, Williams, Leacock, Giddings, Doyle, Hughes, Negouai, Morrell (Adebola 3), McSheffrey (Jorgensen 80), John (Johnson 80). Subs Not Used: Shearer, Shaw.